Tree Tops Ropes Course is not currently available. 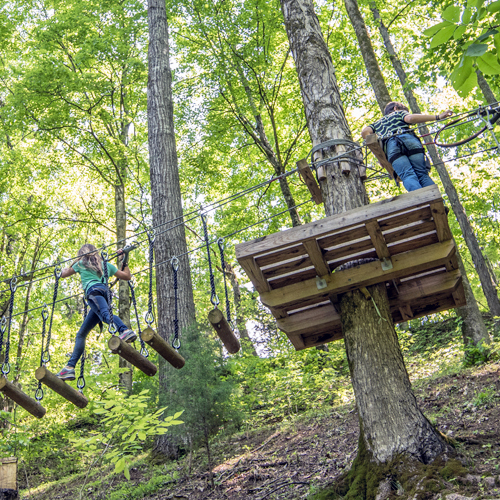 Tree Tops Ropes Course is an aerial adventure course set in the beautiful woods of the Smoky Mountains. Featuring exciting game elements including; suspended bridges, bonus zip lines, cargo nets, and Tic-Tac-Toe bridges. 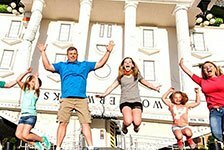 Journey on your own, bring a group, or the whole family for an adventure you won’t forget! Try Zip-N-Ropes where you enjoy 5 ziplines & 6 rope bridges all for a great price! 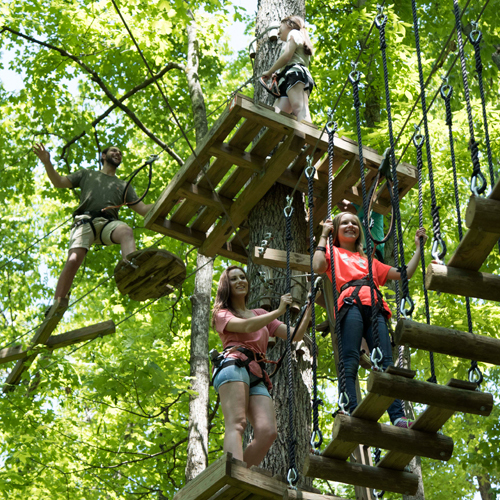 Tree Tops Ropes Course is an aerial adventure course set in the beautiful woods of the Smoky Mountains. 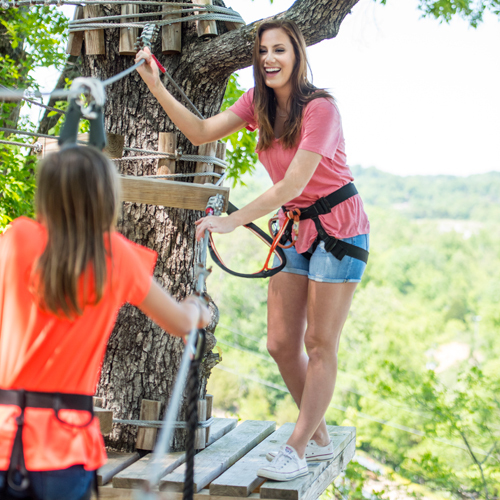 Tree Tops Ropes Course is fun-filled course with thrilling adventure for all ages. Featuring exciting game elements including; suspended bridges, bonus zip lines, cargo nets, Tic-Tac-Toe bridges, and many other rope elements throughout the trees. 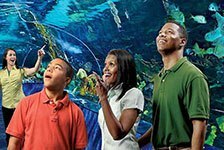 Journey on your own, bring a group, or the whole family for an adventure you won’t forget! New for the season is our Zip-N-Ropes where you enjoy 5 ziplines and 6 rope bridges all for a great price! On the Adventure Park property, located across from Tanger Outlet Mall and behind The Oak Tree Lodge in Sevierville, TN. Please note: Closed toed shoes with a strap or laces is required to participate. Anyone under 16 must have an adult join them on Zip-N-Ropes, on the Junior Course parents must be in attendance while child is on the junior course from the ground, along the course, even with a Minor Release Form. Junior Course is for walk up only and no reservation for the junior course is needed. Parents or guardians must sign a Minor Release Form for children under the age of 18. With light rain, we still operate and you can expect to get wet. We do not operate in lightening or heavy winds for safety reasons. We issue rain checks should it apply. How old do you have to be for the adult course? Are there any height or weight restrictions? The adults’ course is intended for people ages 12 and up. Guests must be a minimum of 60” in height with a maximum weight of 275 lbs. (Sorry, but we cannot make any exceptions.) Overall, you have to be able to fit into a harness (we can accommodate, roughly, a maximum 48″ waist and 26″ thigh, depending on body shape), and be physically capable of performing this activity. How old do you have to be for the Kids Course? Are there any height or weight restrictions? This is intended for children ages 8 and up. Children must be 45” – 60” in height. 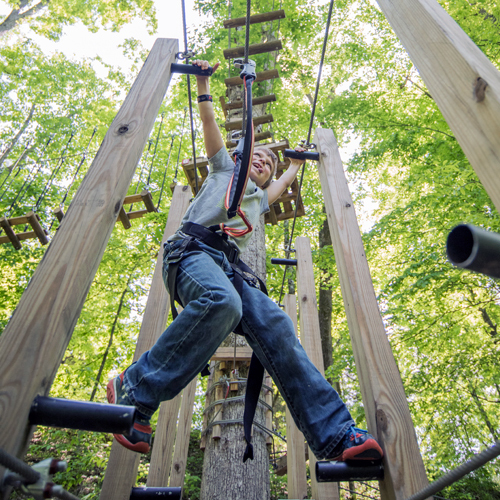 Where is Adventure Tree Tops Ropes Course located? Adventure Tree Tops Ropes Course is located near Pigeon Forge, at Adventure Park in Sevierville, TN. We are located across the street from Tanger Outlets and behind the Oak Tree Lodge hotel. What if the park is busy? 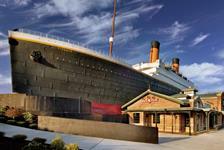 Like any attraction in the Smoky Mountains, we tend to be busy on weekends, holidays and during school breaks. If you come during those times, you may have to wait a bit to get started. 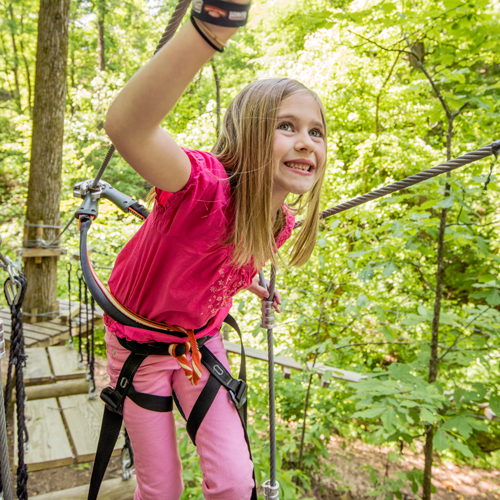 We want you to have fun at Adventure Tree Tops Ropes Course, so we use our experience to expedite your start time, without compromising our safety standards. What are the hours? What does “last admission” mean? Are you open on holidays? 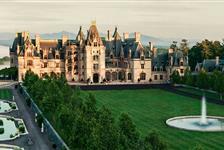 We are open every day at 10 a.m., weather permitting, including Christmas Day. We close when the last guest is off the course, but our “last admission” time is the latest we will sell admission, because we want you to have time to complete the course(s) before dark. This time changes with the seasons, because dark comes sooner in the winter, and later in the summer. I’m ready! Can I just get started on the Pigeon Forge Ropes Course? We believe you’re ready, but our policy is that you may go on the course only after completing the ground school safety training. There are no exceptions; we need to know you’re up for the adventure. My child is very athletic and has been ziplining through a ropes course before, but she is only 44″ tall. Can she go on the courses, since she’s experienced? No, we’re sorry. The minimum height restrictions are to ensure that the participant is able to reach the lifeline throughout the courses, to clip on and off. We want to keep each of our rider’s safe throughout the entire experience. Can I take a break if I get tired, or can I go have lunch and finish the course later? I really want to try it, but I’m not sure I can make it all the way through. I’ve never done something like this. What if I get too tired or too anxious? 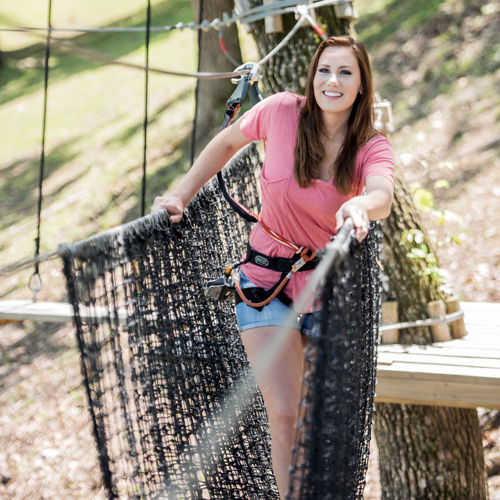 In the event of inclement weather, emergency health concerns, fatigue, fear, or any other reason a person cannot continue the course, specially-trained Adventure Tree Tops Ropes Course’s Safety Officers are available to help you off the course quickly and safely. We hope that guests will evaluate their health before attempting the course, to avoid any problems along the way. There are no refunds if you are unable to complete the course for any reason. 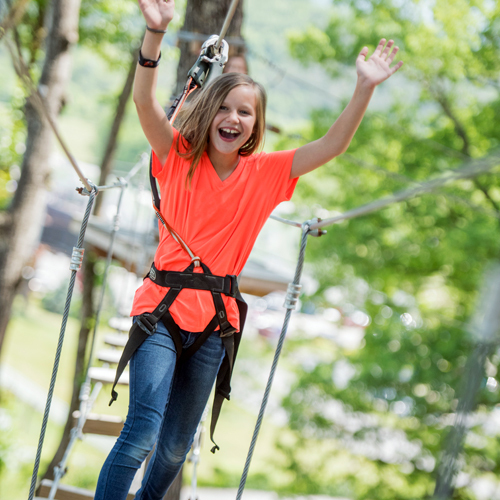 How long does it take to complete the Adventure Tree Tops Ropes Course in Pigeon Forge? We estimate that Zone 1 will takes guests one and a half hours to complete, and Zone 2 will take roughly 45 minutes to an hour. For guests choosing to add to their adventure by selecting the combo option of Zone 1 and 2, their experience will last approximately 2 and a half hours. The time to get through the course depends on a number of factors, including your skill level and the number of participants ahead of you. Experienced adventurers can complete the ropes course in much less time, but you can’t pass those in front of you, so if you like to move quickly, it is best to come at less crowded times. 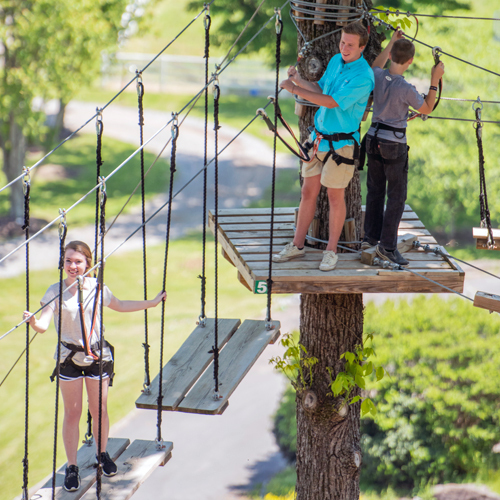 We recommend that you allow plenty of time to experience the Adventure Tree Tops Ropes Course. We do not refund admission if you are running late for your next event or reservation. 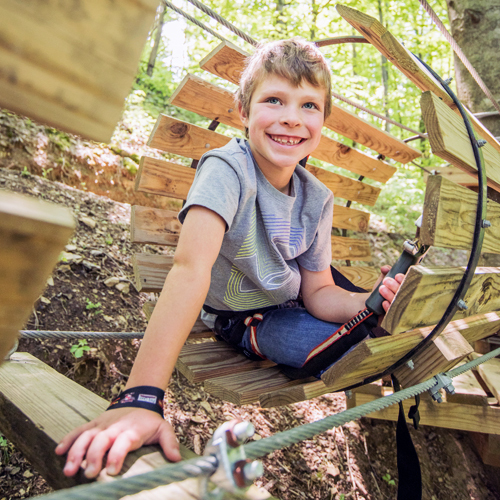 Can my child go through the Adventure Tree Tops Ropes Course without me? Parents or guardians must sign the Minor Release Form for any children under the age of 18. Please note: Anyone under 13 must have an adult join them or follow them, from the ground, along the course, even with a Minor Release Form. If I’m old enough to drive, can I bring some of my friends without our parents? You have to be at least 18 years of age, or you will have to have a Minor Release Form signed. Glad you asked! When rain is threatened, our office staff monitors the weather radar to anticipate and assess any potential issues. If it’s just a light rain, we won’t close, but you can expect to get wet. If it’s storming, but the radar indicates it will pass through quickly, we will hold up activity on the courses until the storm passes. If there is any lightning anticipated, be prepare to wait it out. Often, the weather issues are temporary, but in dangerous circumstances, we have to close. If we have to cut short your adventure short due to weather issues, WE DO NOT ISSUE REFUNDS, RAIN CHECKS, OR RETURNS TO FINISH THE COURSES ON ANOTHER DAY. During the rainy season, we strongly encourage you to plan your visit early in the day to avoid disappointment. What if I’m recovering from an injury or had an injury in the past? People wearing casts, braces or other evidence of a recovering injury will not be permitted on the courses. We do not want to set back your recovery. An exception may be made for simple braces routinely worn for added support, strictly at the discretion of the Operations Manager. No pregnant women are allowed on the course. If your shoulder, knee or any other joint tends to dislocate with certain physical activity, you should not go on the course.